Giles Rathbourne is a rich schoolteacher who’s going through a rough patch. His long-time boyfriend left him, he is suddenly alone in a house full of memories, he is teetering on the edge of alcoholism and he’s on an extended sick-leave from work. Needless to say, he’s feeling miserable. One morning a narrowboat breaks down in the part of the canal adjacent to his garden. The owner of the boat is a dreadlocked, tattooed hippie named Smutty. Since Smutty needs a place to keep his boat while he fix it and Giles is lonely, they strike a bargain, Smutty will help take care of Giles’ garden in exchange of a free stay for as long as he needs. These two guys could not be more different from each other. Smutty has a sunny and positive take on life whereas Giles is pessimistic and cynic. They feel a strong attraction and even deeper connection so it doesn’t take long before they become friends and lovers. But they have a lot of issues to overcome in order to get their happily ever after, so it won’t be an easy road. I love opposites attract stories, and this one is exactly that. Giles was a straight-laced and spoiled man on the verge of self-destruction. He wasn't depressing though, and neither was Smutty, although both characters had dark and painful pasts. He was very likeable even though he had a fair amount of unlikeable traits, he was prejudiced, a neat-freak, depressed and a bit lazy. Once he meets Smutty, though, he starts to see himself under a different light and he realizes that he needs to change. The romance was believable even though it takes place during a short time period, I felt like both Smutty and Giles were in need of love, support and companionship. They were lonely in different ways and that’s why they just click, I could just see them as lovers but also as friends. I had one big issue with this book and it was the ending, it took me completely by surprise and not in a good way. It involves Giles’ ex-boyfriend and I won’t go into details as to not spoil the plot twist, but I do want to say that I was very disappointed by him. At first I thought that they were going to be a realistic ex-couple, one in which both parts were good and bad, and equally responsible in the ending of the relationship. But no, it turns out that the ex was an evil cartoon villain, crazy and one of those guy that make you wonder how no one realized how insane he was. I mean, Giles lived with him and he never saw any of this? I don’t buy it. I felt this last conflict was unnecessary for the plot, the book was fine just being about the leads finding happiness and dealing with their issues. By the end of the book everything is magically resolved and they never even addressed Giles drinking problem again. This annoyed me because up until that point the story was fantastic, I was in love with Giles and Smutty and I was rooting for them, and this felt like the author took the easy way out. Maybe the reason why the ending bothered me so much was because the book is so beautiful. The setting was compelling and incredibly vivid, it was obvious that Ms. Myles has some type of personal experience with narrowboats because that part was detailed without being boring, it was like listening to someone talk about their life’s passion. The best part of the descriptions was that they were attractive and beautiful but there was no sugarcoating, this wasn’t a magical boat where everything sparkles, nope, the boat was messy and uncomfortable, but regardless of all that I hope I get the chance to visit England and see one. The same applies to the characters, I liked them very much, flaws and all, and I didn’t feel like the ending was up to par. Overall I think Ms. Myles is a very talented author and I want to read more by her, this novella works well as a preview of what she’s capable of and if you can see past through the disappointing ending I think you will enjoy it. 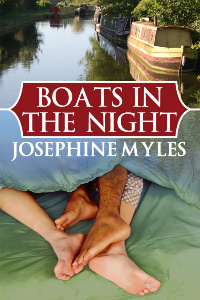 Note: Ms. Myles is offering a free download of Boats in the Night to everyone who subscribes to her newsletter. Here is the link so you can see the details. This offer expires on December 25th so hurry up! Josephine Myles; November 15, 2011. Smutty was hot (and not just because of the fire thing)! He was such a sweetheart that it was impossible not to love him. Great review Brie! I loved this book, although I agree that I didn't love the plot twist. And loved Smutty! The plot twist was crazy and unnecessary IMO,I don't see the need to use external conflicts to make the characters realize that they love each other... But the rest of the story was very good! You always pick up the most interesting and different books. Glad you were able to enjoy this book despite the disappointing plot twist. Giles and Smutty's relationship sounds fascinating. Ha! That’s the exact same thing I think about your book choices, LOL! The relationship between the leads was the best part about the book, that and the setting. You should give it a try, take advantage of the author’s generosity. The heat level is quite high, though. Uh oh. I can understand how you feel about those types of endings. It's like everything is going fine and then there is something unnecessary thrown in. Sounds like it was pretty good otherwise.